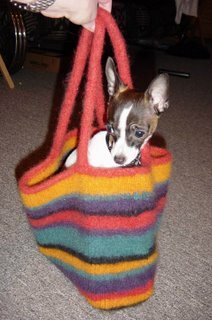 I started knitting this bag a year ago and set it aside. Yesterday I finished knitting it and felted it. She looks a little unsure about this bag thing, but I think the serape look suits Abby's ethnic background. Abby is adorable and the bag looks good, so bright and cheery! Cute! And nice bag, too! Wow! 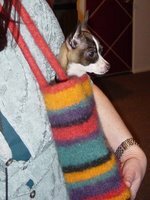 You had the perfect bag almost finished and now you have the perfect dog for the bag. You are seriously "in tune" with your universe.